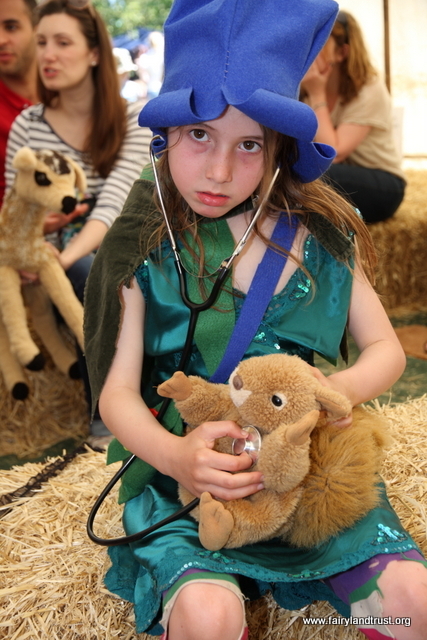 Children love to play in our unique “field hospital” and help “cure” a range of sick cuddly wildlife and other magical creatures often found in Fairyland, before feeding and putting them to bed. 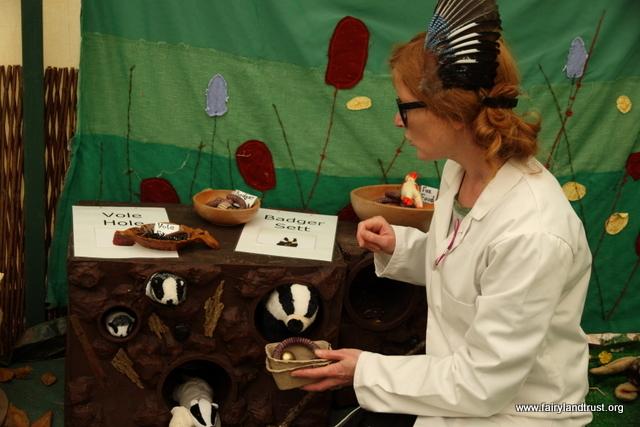 The Fairyland Trust Wildlife Hospital comes complete with supervised dispensary, dressing up clothes, first aid play equipment, play food and beautifully made appropriate beds (i.e. habitats). Children blindly select their magical creature as they wait for the start. The Fairyland vets arrive with a stretcher full of creatures and the children don their overalls and are handed their animal to look after. They then decide (with help if needed from the Vets) what is wrong with their creature and can then borrow bandages, splints, sick bowls and pills to “cure” them. Once treated correctly the rest area is revealed with specific delicious food for each creature to choose from before being placed safely into their real beds, be in a nest, a burrow or a wildflower meadow. Every child receives a sticker and a colour post card of the creature they cared for before singing goodnight to their animal. Gently educational: teaching children to care for wildlife and also where they live and what they eat. Highly silly too. Wildlife Hospital can be run in a 10m x 4m space that you provide. We can run 4 of these 45 minute sessions for 20 children per session, reaching 80 children and 80 adults per day. If needs be we can shorten these sessions to 30 minutes and fit 6 in a day thereby reaching 120 children/ day .